The Rajasthan Royals and the Royal Challengers Bangalore have had a horrid start to the tournament losing all three games that they have played. One of the teams will make it to the 2 points through this game. The Rajasthan Royals have come close every game and have had their moments but have not managed to cross the line. They need some individual to inspire them to a victory to get them back on track. The Royal Challengers Bangalore on the other hand have not really turned up for this tournament. Apart from the game against the Mumbai Indians, they were really blow away by the Chennai Super Kings and the Sunrisers Hyderabad where they were not in the game at any point. Michael Vaughan in a show as jokingly said “Maybe the RCB should try it in the 12’s (Under-12) “ since they have not really managed to compete in this tournament so far. So, there is a lot of pressure on the Royal Challengers Bangalore to turn it around, but they will find it difficult to decode what is going wrong. 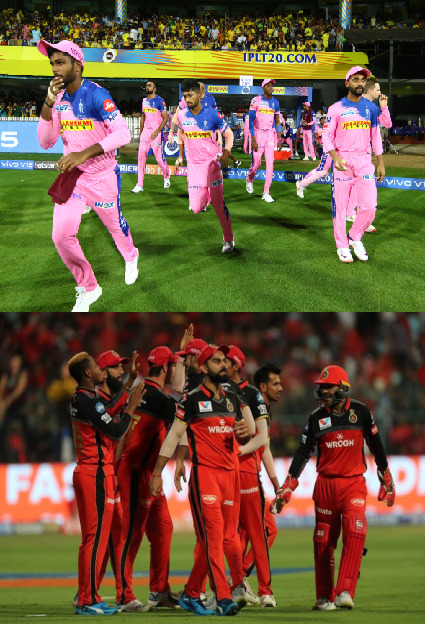 Out of the 17 matches played between the two teams, the Rajasthan Royals have managed to have a slight advantage winning 9 games and the Royal Challengers Bangalore have 8 wins. At Jaipur, the two teams have won 3 matches each. Jos Buttler, for the Rajasthan Royals, after starting well against Punjab, has missed out in the last two games. He is a very important player for the Royals and will be looking to take their team home against the Royal Challengers Bangalore. Virat Kohli, for the Royal Challengers Bangalore, hasn’t really got going in this IPL which is one of the reasons the team is struggling. He is too good a player to not be scoring runs and will definitely look to change the fortunes of the Royal Challengers Bangalore, leading from the front with the bat. The Rajasthan Royals will have Ashton Turner available and will be tempted to bring him in as a finisher since their lower order has struggled so far. They might have to drop Steve Smith which will be a tough call. The Royal Challengers Bangalore will have Marcus Stoinis and Nathan Coulter-nile available and expect them to come straight back in. They could also get Washington Sundar in for Prayas ray Barman to get a better balance. The Pitch at Jaipur is expected to play well for the batsman but with longer boundaries, the bowlers will also have a good chance if they apply their skills well. The Head to Head clashes have gone neck to neck, but for this game, the Rajasthan Royals should start as favorites as they have been in better form compared to the Royal Challengers Bangalore. They just need a bit of extra push from one of the players to get them over the line. The Royal Challengers Bangalore on the other hand will have to figure out a way to get back on track and it should start with Virat Kohli getting a big score. Buttler vs Chahal will be an interesting contest to watch out for, since Buttler will definitely be looking to take the bowlers on and Chahal enjoys a contest. Buttler has got out to Rashid Khan, the leg spinner against the Sunrisers Hyderabad and hence Kohli might look to using Chahal against Buttler straight away.